Sarah Lockwood Winchester (née Pardee; c. 1840 – September 5, 1922) was an American heiress who amassed great wealth after the death of her husband, William Wirt Winchester. Her inheritance from his estate included $20 million (equivalent to $519,241,379 in 2018) as well as a 50% holding in the Winchester Repeating Arms Company, which made her one of the wealthiest women in the world at the time. She is best known for using her vast fortune to continue construction on the Winchester mansion in San Jose, California, for 20 years. Popular legends, which began during her lifetime, held that she was convinced she was cursed, and the only way to alleviate it was to add on to her California home. Since her death, the sprawling Winchester Mystery House has become a popular tourist attraction, known for its staircases that lead to nowhere and its many winding corridors. She was born the daughter of Leonard Pardee and his wife Sarah W. (née Burns), around 1840 in New Haven, Connecticut. On September 30, 1862, in New Haven, Sarah married William Wirt Winchester, the only son of Oliver Winchester, the owner of the Winchester Repeating Arms Company. The couple was married in 1862 and had one daughter, Annie Pardee Winchester, who was born on June 15, 1866 and died on July 25, 1866 of marasmus. The couple had no more children. Her father in law died in 1880, and her husband William died of tuberculosis in March 1881. Thus she received an inheritance of $20 million (equivalent to $519,241,379 in 2018). In addition, Winchester received approximately 50 percent ownership in the Winchester company and an income of $1,000 a day (equivalent to $25,962 in 2018). In 1888 Winchester purchased 140 acres of land, the majority of what is now downtown Los Altos, California, to use as a ranch. She also purchased a farmhouse, now known as the Winchester-Merriman House, for her sister and brother-in-law. The house is listed on the Historic Resources Inventory of the Los Altos Historical Commission. In the 1920s Mrs Winchester also maintained a houseboat on San Francisco Bay at Burlingame, California, which became known as "Sarah's Ark," as it was reputedly kept there as insurance against her fear of a second great flood, such as the Biblical one experienced by Noah and his family, but a more mundane answer is that many people of her social standing in California at that time had houseboats or yachts. The "Ark" was located near the eucalyptus grove at Winchester Road, south of what was to become the intersection of Anza Boulevard and U.S. Highway 101. The ark was destroyed by fire in 1929. On September 5, 1922, she died in her sleep of heart failure. 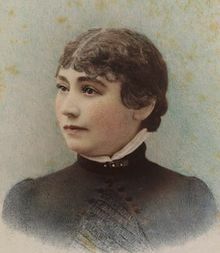 A service was held in Palo Alto, California, and her remains lay at Alta Mesa Cemetery until they were transferred, along with those of her sister, to New Haven, Connecticut. She was buried next to her husband and their infant child in Evergreen Cemetery, New Haven, Connecticut. She left a will written in thirteen sections, which she signed thirteen times. The belongings in Winchester Mystery House were left to her niece, Marian I. Marriott, who took what she wanted and auctioned the rest off. Following her death, the home was auctioned to the highest bidder, who then turned it into an attraction for the public; the first tourists walked through the house in February 1923, five months after Winchester died. 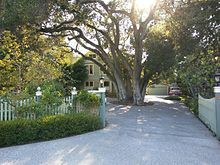 The Santa Clara-Los Gatos Boulevard in front of the house was later renamed Winchester Boulevard, after the house. Today, the house is open to the public every day except Christmas Day. Tours are conducted of both the house and the grounds on those days. In 2016, French director Bertrand Bonello's short film Sarah Winchester, opéra fantôme received an exclusive global online premiere on Mubi. She was portrayed by actress Helen Mirren in the 2018 horror film Winchester. ^ a b Wagner, Richard Allan. "The Truth About Sarah Winchester, the Belle of New Haven". The Truth About Sarah Winchester. Retrieved August 10, 2017. ^ Ignoffo, Mary Jo. "Captive of the Labyrinth: Sarah L. Winchester, Heiress to the Rifle Fortune." Columbia, Mo. : Univ. of Missouri Press, 2010. See p. 112. ^ "Sarah Winchester: Woman of Mystery". Winchester Mystery House, LLC. 2003. Archived from the original on 26 August 2013. Retrieved 16 August 2013. ^ "Winchester, Sarah Pardee, 1837-1922". Library of Congress Name Authority File. Library of Congress. 1993-01-29. Retrieved 2013-08-16. ^ Wagner, Richard Allan. "The Belle of New Haven". The Truth About Sarah Winchester. Retrieved 15 April 2019. ^ Burr, Elliott. "Los Altos History Museum display dispels myths of Sarah Winchester". Los Altos Town Crier. Retrieved 24 September 2016. ^ Snyder, Carolyn. "Los Altos' legacy: the homey beginnings of Los Altos historic resources". Los Altos Town Crier. Retrieved 24 September 2016. ^ "Haunted Travels: The Winchester Mansion". ^ Ignoffo, Mary Jo. "Captive of the Labyrinth: Sarah L. Winchester, Heiress to the Rifle Fortune." Columbia, Mo. : Univ. of Missouri Press, 2010. See p. 207. ^ Fleming Jr, Mike (May 14, 2016). "Helen Mirren Takes Aim At Playing Firearm Heiress In Hot Cannes Package 'Winchester'". Deadline Hollywood. Retrieved May 16, 2016. New York Times; June 12, 1911, Monday; Winchester's Widow Dying. New York Times; May 31, 1970, Sunday; San Jose, California. "A stairway that leads nowhere, a window that opens to reveal only a wall, a doorway that leads to nothing. These are parts of a disjointed, 160-room Victorian mansion that Mrs. Sarah Winchester built on the northern outskirts of San Jose after the sudden loss of both her husband, the son of Oliver Fisher Winchester, the rifle magnate, and her daughter. After her daughter's death Sarah Winchester never tried to have kids again. Also after the death of her husband William Winchester, Sarah never married again." Ignoffo, MaryJo (2010). Captive of the Labyrinth, Sarah L. Winchester Heiress to the Rifle Fortune. Columbia, MO: University of Missouri Press. ISBN 978-0-8262-1905-3.